When I first think of Christmas gifts, I always think of pajamas, and one of my favorite sleepwear websites is Sleepyheads.com. You may remember them from a couple of years ago, when I featured them in my holiday gift guide. 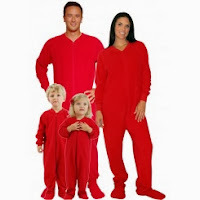 Sleepyheads has pajamas for the whole family! Adults, kids, you name it. They have a wide variety of pjs, footed pajamas, robes and slippers. And most items start in the $10-20 range. The thing I love about pajamas is that they are so versatile, you could buy a pair for everyone on your list and be done! I was recently given the opportunity to review these Pajama Heaven Black & White Floral Satin pajamas! These pajamas are so cute and comfortable. The satin is so soft and smooth and the fit is slightly bigger, but still fitted enough where it still looks flattering. The material is a nice quality and looks as if it will last. I love wearing these! Footed pjs for the family! How cute would these be for pictures? 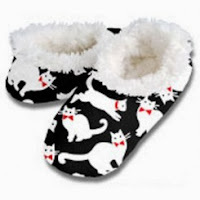 And these slippers are only $12.99! How cozy do these look? Buy it: The Sleepyheads site is easy to use and they often have a sale going on! Right now they are offering December deals where they have a reduced item everyday! They also have a bunch of everyday sales going on right now, so if you're thinking of doing some Christmas shopping for pjs, check them out! 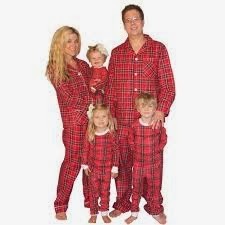 I love the red plaid family pj's. The plaid ones are adorable! I love the PJ SALVAGE PAISLEY TURQUOISE FLANNEL PAJAMAs!! So cute. I love The Cat's Pajama Here Kitty Kitty Pink Flannel! I love the paisley pajama set. I like the PJ Salvage Dogs Blue Pajama Set. I like the Sassimi Del Mar Sleeveless Pajama! Very cute and comfy! David & Goliath Flower Skully Tank and Pant is super cute! I'd like the kids Christmas tree pajamas. I also like the Christmas Ornaments Family Pajamas! I love the sassimi del mar pj's! i like the lazy one classic moose footed pajama. Mmm..plaid flannel for me. Yummy. I love the "Lazy One Don't Moose Men's Footed Pajama". Super super cute! Love these! The ornament matching family pajamas! Wow! These are perfectly cool sets of pajamas. I love every piece of this stuff. Great pajamas are indeed perfect sleeping buddies. These super cool nighties mean comfort. Thanks.